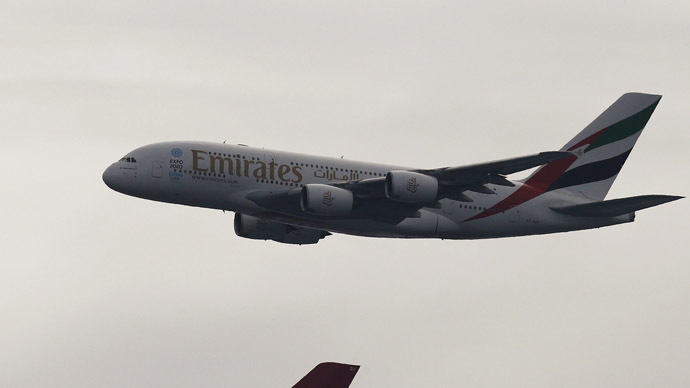 An Emirates plane flying from Dubai to New York JFK has declared an emergency and diverted to Manchester, Britain. The aircraft is carrying a sick passenger, who is to be taken to hospital, media reported. AirLive.net reports that the aircraft touched ground in Manchester at around 13:20GMT. Manchester has the third busiest airport in Britain after Heathrow and Gatwick. The plane has a sick passenger on board, Flightradar24 reports, adding that he will be taken to hospital by ambulance. At the moment, the website lists the flight as delayed. EK201 flight is to continue its route to JFK in 50 minutes after refueling, reported AirLive.net. The Airbus A380, a double-deck wide-bodied jet, is among the world's largest passenger airliners, and provides seating for up to 525 people in a typical three-class configuration, or for up to 853 people in an all-economy class seating plan. The Emirates Airline has diverted over 100 flights due to medical emergencies in two years; this cost more than $12 million, del Al-Redha, Emirates' executive vice president and chief operating officer said. "In 2013 and 2014, we diverted over 100 flights for medical emergencies, costing more than $12 million. Unplanned en route diversion of a flight has its own challenges and logistics, and in a number of cases extended delays are experienced," he said.